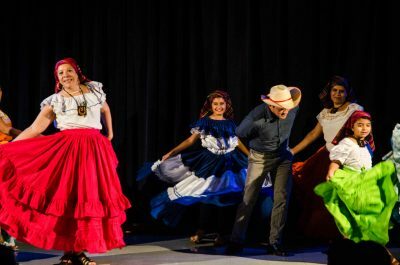 Children of El Salvadoran immigrants spanning from 5–18-year-olds took to the stage in the George Sherman Union Auditorium to perform stories they created in “The Last Dream.” Yet the trials and tribulations they acted out onstage mirrored struggles they may soon face. The production, performed Friday night, was the latest show by the Boston Experimental Theatre Company. The parents of the children in the performance live in the United States under Temporary Protected Status and may be forced to leave the country in the near future. “The Last Dream” follows BETC’s theatrical approach inspired by dramatist Antonin Artaud’s concept, the Theatre of Cruelty. The style reflects a type of performance that aims to create an emotional connection rather than solely entertainment and to remove barriers between the audience and performers. TPS is granted by the Department of Homeland Security to foreign nationals who have fled their own countries during humanitarian or natural crises. The program was launched in 1990, and now over 300,000 foreign nationals live in the United States due to the program. The program allows holders to live, work and buy homes in the United States, and children born to TPS parents in the United States are considered American citizens. According to the Center for American Progress, the average TPS beneficiary has been living in the U.S. for 19 years. In late 2017, and later on in early 2018, the Trump administration announced that it was terminating TPS designations for nationals from Sudan, Haiti, Nicaragua, El Salvador, Nepal and Honduras. TPS designations from Sudan expire Nov. 2, and designations from Honduras expire in January of 2020. Jared Wright, an associate producer at BETC and co-writer and co-director of the show, said BETC associates were inspired to produce a show about TPS after first hosting a theatrical workshop with the children of Comité TPS Massachusetts, a Massachusetts chapter of the National TPS Alliance. The National TPS Alliance was formed in June 2017 in Washington, D.C., by TPS recipients. With committees and organizations across the country, the alliance’s Massachusetts committee has become well-known, with over 1,000 members in its Facebook group. Wright said BETC quickly realized that they had a larger duty as Bostonians to do something more to help their fellow community members. Jose Pineda, of Saugus, and a member of Comité TPS, said he has struggled to put into words how he’s felt about the termination of the TPS designations. According to Wright, “The Last Dream” is more than a show. It is a call to responsibility. “What is it we need to do to be that community for others so that we can have the world we need to have, not even the world that we dream of or want, but the world that demands humanity?” he said. The program for the show included the contact information of U.S. Sens. Elizabeth Warren and Ed Markey and a website where donations could be made to Comité TPS to fund their journey as they spread awareness and rally for their cause.